The Chitwan National Park in Nepal is famous for its Royal Bengal tigers and one-horned rhinoceros, but the wonderful creature we got to know – and love - best was the elephant. The Bengal tiger, however, remained elusive. 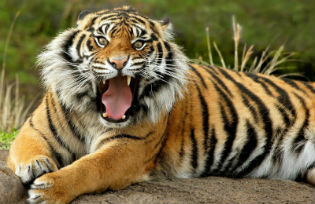 Once a royal hunting reserve, Chitwan National Park actually has only 200 or so Bengal tigers still extant, although they say the numbers are increasing thanks to their tiger protection programme. Be that as it may, they remained elusive and during our stay we didn’t see a single one. Needless to say, the huge variety of bird and animal life kept us entertained! On our first day in Chitwan we spent an afternoon on the river in locally-built canoes. 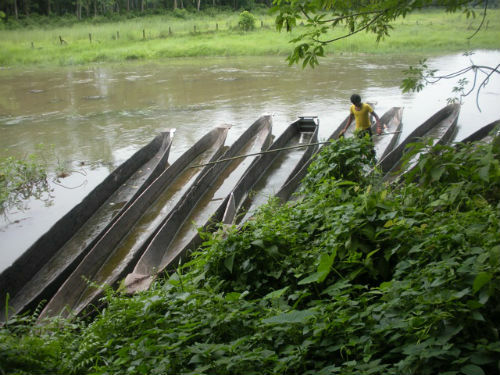 They are sort of squared‐off in shape, and handcarved, and looked a bit dodgy in terms of reliability: this impression was reinforced by the way our guides scooped the water out of one canoe before we could take it for our ride. As it turned out, the canoes are very solid. We saw lots of birds, especially egrets, which live there in abundance. 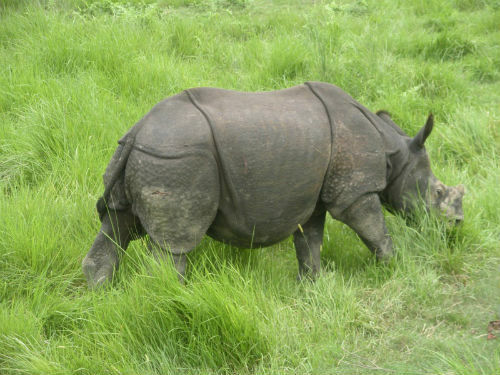 Chitwan “Heart of the Jungle” National Park in south-central Nepal has been a World Heritage site since 1984. 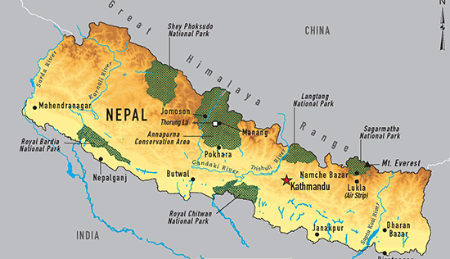 Covering an area of over 900sq.km, Chitwan lies in the central climatic zone of the Himalayas – a vast swathe of alluvial grasslands and subtropical forests. We had the good luck to see a Nepalese Kingfisher, a brightly coloured version of that bird, red, yellow and turquoise. He flew right over the canoe I was in, dove down and caught a fish, and then flew back the way he had come. We also spotted a large “crocodile” near our boat on a sandbar. He looked more like what I would call an alligator, but was smaller than his American cousin: very fat, and with a different sort of head. Unfortunately we missed out on seeing the rare crocodile with the long snout called a Gharial, a native of the Indian subcontinent which is actually on a list of critically endangered species. The Gharial has an incredibly long skinny snout, which is apparently great for fishing. When the canoes docked, there was an opportunity for us tourists to take an elephant bath. 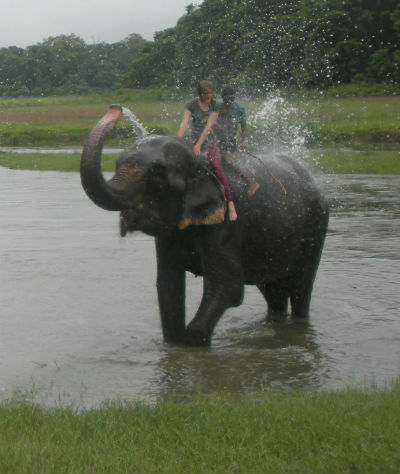 I had bought a postcard of that spectacle in Kathmandu, but didn’t realize before Chitwan that the elephant gives YOU a bath, and not the other way around. One of the women on the tour volunteered, and was helped astride the elephant, who was standing in the river. She had to hold on for dear life to a rope around the elephant’s neck. I couldn’t have done it, I would have landed in the river, for a different kind of bath…BUT, the rest of us had a good time watching her get splashed several times – rather violently – by the elephant. He would draw water up from the river into his trunk, and then let go on her with it. Since it was a warm, muggy day, she said it was very refreshing, and although I wouldn’t have used that term to describe what I saw, it DID look like fun. She got sprayed with several very intense showers of water, one blast every few minutes, as the elephant got the water into its trunk and then let go with it at her, over his back. This elephant, as with other ones I encountered later on, are working animals. This was one of his day jobs. Ho hum, splash another human. People are weird, what else is new? Later that day, I went on an Elephant Safari. The elephants have the same “mahout” or handler for their entire life, and live in the village. 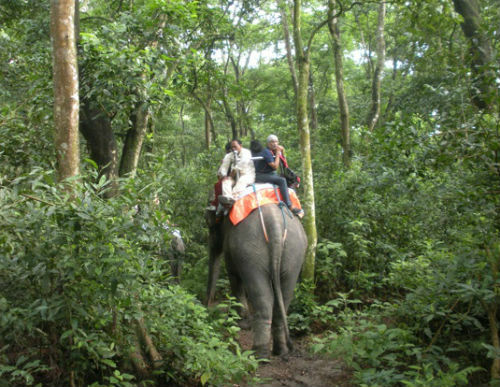 Our mahout was about thirty, had short dark hair and was dressed in Western-style clothes. He did NOT speak English. I got the feeling he was sort of tired of his elephant, who was very old, since he never smiled at all, in fact, seemed sort of pissed off. He alternated between hitting the elephant with a stick and a metal rod in the hopes of getting the elephant to do what he wanted. Who am I to judge though? Elephants are HUGE, and since he had had this elephant for a long time maybe he was just tired of it, and tired of hauling silly tourists around! To get onto the elephant, you climb up some wooden stairs to a sort of elevated platform and then clamber on to her back, which is saddled with a wooden rack called a howdah. Four people can ride in a howdah at any given time, one in each corner with their legs dangling over the side. I was lucky to have a space in front next to the mahout. Sharing the elephant with me were an East Indian guy and two talkative Chinese women, who were friends. At first we went down a direct path, one that even a car could traverse, into a large green meadow. There we encountered one of the famous one‐horned rhinos, who was blissfully unfazed by the presence of a group of elephants with people on them getting as close as possible to take photos. She continued to feed on the tall grass as if we weren’t there at all. After getting our photo ops with the elephant, the safari took an unexpected (for me) turn, as we suddenly veered off the meadow directly into what appeared to be totally impenetrable undergrowth., and proceeded up and downhill through a thicket of branches, which thwacked us unmercifully, unless one of us had the presence of mind to push them out of the way, which was sometimes difficult. The two Chinese gals found this hilarious, and each time we were confronted by branches, they would laugh and start singing some Chinese folk tune. I wish I had known the reference for that one! Riding an elephant is sort of like sitting on a lumpy, moving mattress. As we rolled and rocked along, our elephant waved her ears back and forth to shoo away flies and other insects. She kept hitting my leg with one of her ears, but I didn’t mind, in fact I took a couple of photos of that lovely ear. I found out that Asian elephants’ skin turns pink with age, and this elephant was apparently quite old, since she had wide bands of pink at the base of her ears, covered with black polka dots of about ½ inch in diameter. Not painted. Her skin. She was nobody’s fool, and took many opportunities during the safari to grab bunches of grass with her trunk and eat to her heart’s content. She would twist the grass out of the ground using her trunk as a hand, and then put it into her mouth in a large clump. She had other skills too, and did a little clearing of branches when they obstructed the “non‐path” which we were on. I think we got one of the last tours of the day, because my elephant went home after we disembarked. I had planned to feed her some bananas, but I had to feed them to another elephant who was still on the job. It was great watching her take the banana in her trunk and eat it – skin and all – in one gulp. One of the final treats of the safari was the sighting of a wild peacock, sitting calmly on a branch – he patiently endured an impromptu photo session until he decided that he had had enough and flew off. Peacocks are held in special regard by the indigenous people of the area, the Tharu. Before I left Chitwan Park, I got to see the amazing Peacock dance again which I had previously seen in Kathmandu at a restaurant. It was performed at the district’s cultural centre by one of the local Tharu guys dressed up in a peacock costume who strutted his stuff at the end of the evening’s entertainment. After fanning with his tail, he came around to collect tips for the musicians and dancers he performs with. It made me consider the USA. Whatever happened to the two-men-in-a-horse costume? We could learn a thing or two from the Nepalese and their Peacock dancer! 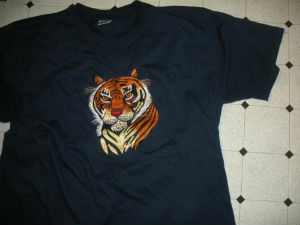 My only disappointment was not seeing the Bengal Tiger while in Chitwan, so I settled for buying a tiger tee‐shirt instead, with a great hand‐produced, stitched tiger on the front, sewn in a shop by a Nepalese guy. Irene Dogmatic lives and works in the Bay Area of San Francisco and paints in watercolor and acrylic. She does commissioned animal portraits and also paintings about romance, politics, flowers and life in general.